Slash, the Electro-cat, as a crazy kitten. In truth, the kitten in Cat Yoga isn’t doing yoga at all. Unlike Santra, the Finnish yoga bear, Shorty the cat is just being a kitten, and someone with a good grasp of yoga-speak, (and a less firm grip on Sanskrit spelling), has put his antics into a video. I pass it on in part because it made me laugh, and in part because the kitten so reminds me of our beloved black cat, who was a wild-eyed kitten for all of her 15 years. To return to human yoga, it’s a rarely remarked on fact that while Freud need a couch to effect lasting psychological change, yogis only need a chair – albeit a sturdy one with an open back you can step your legs through. Armed with a suitable chair, and a patient, respectful attitude, you can gradually teach your body to open into a deep back bend. Back bends are powerful anti-depressants. They take us inward, to the happy and expansive neighborhood that lies at the centre of our being. Cultivating back bends means cultivating clarity, optimism and joy. But as noted here last week, you can’t just go out and buy a yoga chair, although you can order one and have it shipped, at what seems like a hefty, and largely unnecessary expense. Folding chairs, as they come from the office supply store, need the backs taken out of them. According to the comments on last week’s post, many of you have no problem taking a hammer to a metal chair, and, presumably, doing the sanding that follows. I salute you. For those, like me, who feel disinclined to take on the task, there’s good news. If you live in the Vancouver or nearby, Grant Richards (grantrichards@telus.net) will do it for you for a reasonable fee. He’s also open to teaching you how to do it so you can pass the skill on to others. Grant also passed on the YouTube video for taking the backs out of folding chairs – in this method using a screw-driver and files, rather than a hammer. So now I feel like I’ve done my duty and can offer this Five-Minute Yoga Challenge to all who have chairs and to those who are about to get one. 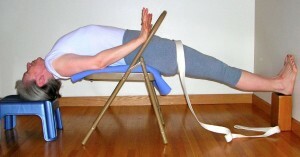 This is a supported version of Dwi Pada Viparita Dandasana (two foot inverted stick pose). Although the full pose is considerably more demanding, they both offer a long opening for the front body, and a refreshing, spirit-lifting back bend. Tip the chair towards the wall to step in. To start, place a chair about two feet away from a wall, with the chair seat facing away from the wall. 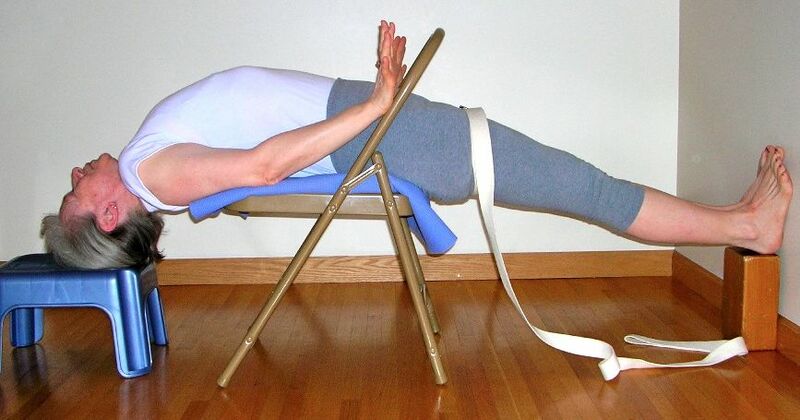 Fold a sticky mat in four and place it on the chair. Put a wood brick at the wall, on its tall side. Have a strap with a loop in it nearby. Place a small stool with some chip foam blocks on it near the front of the chair seat. If you are trying the pose for the first time, have the blocks for your head level with the seat of the chair. With one hand on the wall for balance, tip the back of the chair toward the wall. Step your feet into the opening, then let the back of the chair tip up again and sit down. Slip the strap over your feet, place it around your upper thighs, and tighten it until it gives you a firm pressure. Bring your buttocks over the edge of the chair toward the wall, then slide back. 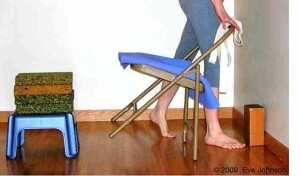 Now, supporting yourself on your elbows, move your buttocks over the edge on the wall side of the chair. With the back rim of your pelvis scraping along the seat of the chair and your navel moving toward your spine, move back onto the chair until your shoulder blades hook over the front edge of the chair seat. Depending on how long your back is from buttocks to shoulder blades, your buttocks may or may not be resting on the chair when your shoulders are in place. The taller you are, the more likely you are to find that your buttocks are not on the chair. Let your head come to rest on the support. Hook the bottom edges of your shoulder blades over the front of the chair seat. Press your feet into the wall, resting the back of your heels on the brick, and straighten your legs. Press your hands into the back of the chair and use that pressure to connect with your shoulder blades and stretch more through your upper ribcage. Relax your face. Feel the length of your front body. Let your brain be passive. If you are completely comfortable, remove one block from under your head. See how it feels. 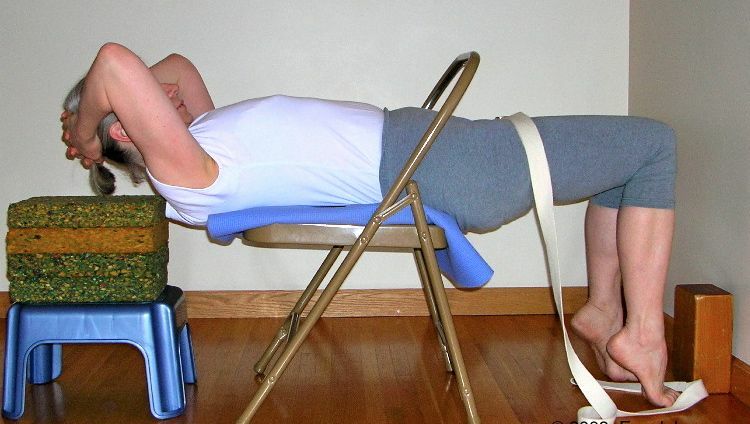 Continue to remove blocks until you find the level of support that gives you a strong stretch through your front body without strain in your neck or lower back. Be patient. Make sure your experience remains intense and yet pleasant. Press the back of the chair to increase the stretch across your chest. To increase the work of the upper back, bring your hands under the chair seat and hold the legs of the chair, or if your arms are long enough, the rung at the back of the chair. For a deeper stretch through your side ribcage, you can also clasp your elbows and stretch your arms overhead. Stay for one to five minutes. For a deep stretch, hold the back rung of the chair, palms facing up. To come out of the pose, bring your feet to the floor and your buttocks back on the chair seat. Grip the sides of the chair and press your elbows down to lift your chest. Sit up with your chest lifting, bringing your head up last. Bring your buttocks to the centre of the chair. Sit erect. Notice the feeling of quiet in your mind, and the smile that comes by itself. Then do a soft twist in each direction, one arm to the chair back, the other to the seat of the chair. Step out by standing up and tilting the chair back toward the wall. Back bend in a chair can be done as a stand-alone practice any time you need a boost of energy and a change of perspective. In a longer practice, warm up in downward dog and standing poses. 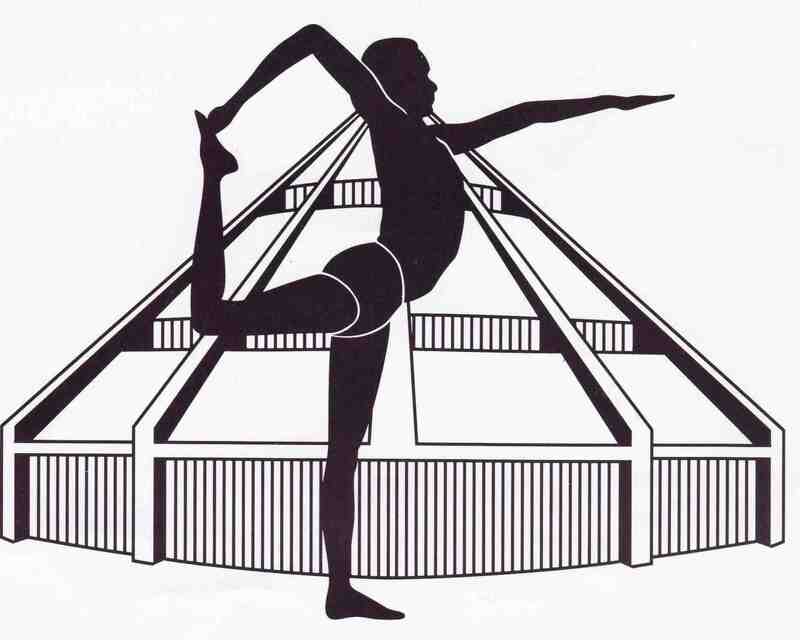 Use this pose as a preparation for other back bends, and for shoulder stand. If your back pinches in the pose, check that the strap is firm on your legs. Raise your feet by adding an extra brick. Then work to strengthen your bungee cord, by moving your lower ribcage toward your pelvis. 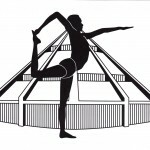 If lower back pain persists, come out of the pose. Sometimes the pressure of the chair into the back ribs feels painful, especially if it’s a new sensation. Check that your shoulder blades are in the right place, and that the chair is not too low on your back ribs. Do not do this pose on your own if you have an existing neck or back injury. Instead, check with your teacher to see if it is suitable for you. I continue to be amazed at your creativity and innovation. 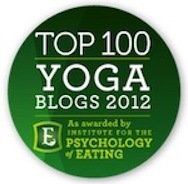 You are indeed an inspiration to this yogini crone. Your site has become my favorite “go to” yoga spot. Hey thanks, Trish! You made my day. GREAT cat video. Nice way to remember your feisty little black cat! 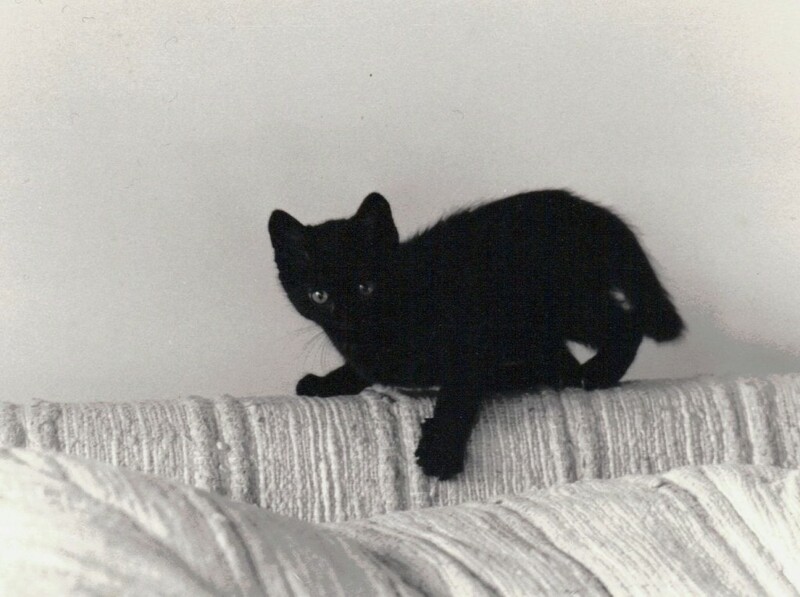 Yes, watching that video makes me long for another crazy black kitten, which would make it three in a row. 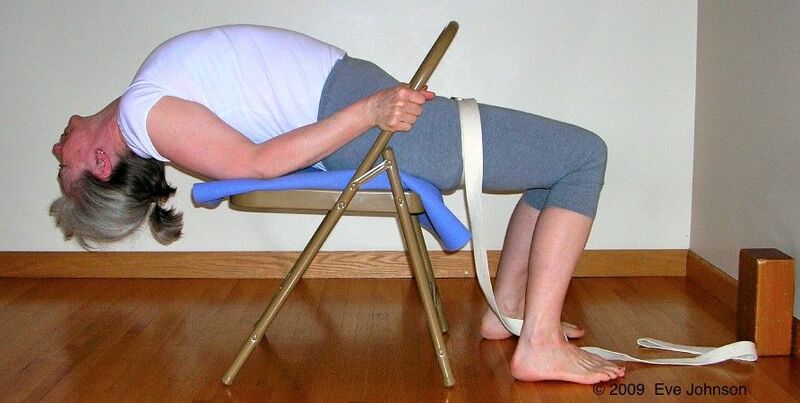 Previous post: We need yoga chairs, but where can we get them?